Today we have a first timer here at The Book Pushers. I’d like everyone to extend a warm welcome to a dear friend of mine, Marcy Rockwell. Marcy is here to talk to us today about a different kind of fantasy that we have yet to showcase here at The Book Pushers: tie-in fantasy. Take it away Marcy! Hello, Bookpushers! Thanks so much for letting me take part in your Fantasy Celebration! My name is Marsheila (Marcy) Rockwell and I’m here to talk to you today about a type of fantasy fiction you may not have tried before – namely, tie-in fiction. Okay, first off – what is tie-in fiction? In technical terms, it’s fiction that “ties in” to some other media property, like a television show, movie, video game, or role-playing game. But put more simply, it’s the two entire bookcases in the science fiction and fantasy section of your local brick and mortar bookstore that are filled with Star Wars, Buffy, Warhammer and D&D novels. That’s the section where you’ll find my most recent book, The Shard Axe, which ties in to the world of Dungeons & Dragon Online (DDO). You may have heard that tie-in fiction is nothing more than glorified fan fiction – usually from people who’ve never actually read any, or whose last foray into the field was during the Carter administration. I’ve rebutted that argument elsewhere, so I won’t waste your time with it here. Suffice to say that, when you have Hugo and Nebula Award winners writing tie-in fiction, the idea that it’s somehow of lesser quality than “original” work goes flying out the window faster than a sparkly vampire about to be caught stalking his underage girlfriend (heh). So, now that we’ve gotten that out of the way, I’d like to focus on a question raised by Bookpusher’s very own MinnChica. Namely, how does a writer make tie-in fiction his or her own? As a tie-in writer, you’re writing in a setting someone else created, often using other people’s characters and/or plot lines. You might think those constraints would leave little room for creativity and that it would be harder to put your own stamp on a story because of them, but you’d probably be surprised to learn that it’s really no harder than doing the same thing with original (i.e., creator-owned) fiction. With creator-owned fantasy fiction, the setting, character and plot may all be yours, but you still have constraints. For example, if you’re writing urban fantasy set in our world, then your Chicago has to resemble our Chicago, or you don’t get to call it that (at least not without annoying your Windy City readers). Things like gravity and the laws of physics have to work the way we expect them to, unless you’ve come up with a logical reason why they don’t – preferably a reason that’s integral to your story. Even when you’re writing in your own made-up world, you will still have rules you need to follow, and follow consistently. If magic exists in your world (and it probably will, since we’re talking about fantasy here), then it has to follow a set of rules that don’t change from situation to situation. And if they do change? You guessed it – you have to have a reason for it. And that reason can’t be “because it sounded kewl,” either, because readers aren’t stupid. They know when you haven’t taken the time to think out how your world works, and few things will make a fantasy reader throw your book across the room faster. After all, if you don’t care enough to build a consistent world, why should they care enough to try to make sense of it? Likewise, your characters have to have believable reasons for what they do, or else they ring false to the reader and – whoosh! Book across the room. The same constraints hold true for tie-in fiction. If, say, the heroine of The Shard Axe (Sabira) spends a lot of time in the DDO city of Stormreach (and she does), then the Stormreach in the novel had better match the one in the game. If characters can’t fly in-game, then I can’t suddenly make Sabira sprout wings and jump off a cliff to escape danger. If I do? Book, meet wall. The only real difference with tie-in fiction is that the rules writers have to follow aren’t ones that they also had to make up. And just as the story-telling constraints are the same, regardless of whether a book is tie-in or original fantasy fiction, so too is the way in which a writer goes about making a story stand out within the bounds of those constraints. For The Shard Axe, I chose to set a large portion of the story in a part of the world that hadn’t gotten much attention, and to focus on a race that had similarly been largely underutilized – namely, the dwarves and their homeland. I chose to tell a type of story that hadn’t been seen yet – the hunt for a serial killer, complete with some courtroom drama. I chose to add elements to the story that aren’t typically considered a staple of D&D novels, like a romantic subplot and an urban fantasy-type heroine who is equal parts snark and heart. Now, granted, I had more freedom in the tale I wanted to tell in The Shard Axe than the person who writes, say, Criminal Minds tie-in fiction, but even that person (Max Allan Collins, aka the Tie-in God) is able to make those stories his own. How? By doing the same thing any writer does, whether they’re putting out tie-in fiction or creator-owned work. Look for things that haven’t been done before, or new ways of presenting old ideas. Mix genres – The Shard Axe is fantasy noir with an urban fantasy feel and a murder mystery at its core. Give characters motivations readers can understand, and make the stakes matter. Sabira is driven by guilt, duty and a sizable gambling debt to accept a mission she doesn’t want, protecting a dwarf she can’t forgive, in a city full of memories that won’t stop haunting her. I’m biased, of course, but that’s a storyline that I would find compelling no matter what universe it was written in. And that’s probably the most important answer of all. How do I make a book stand out, be it tie-in or creator-owned? By telling a story I want to read. And hopefully, if I’ve followed my own advice, it’s one that you’ll want to read, as well. Marsheila (Marcy) Rockwell is the author of the forthcoming Dungeons & Dragons Online novel, Skein of Shadows, a sequel to The Shard Axe (Wizards of the Coast, 2011). She has also written another unrelated novel, Legacy of Wolves (Wizards of the Coast, 2007), set in the same universe. Her creator-owned work includes a female-centric series of Arabian-flavored sword & sorcery stories, Tales of Sand and Sorcery, put out by Musa Publishing. The first two installments, “Shaala, Made of Stone” and “The Jade and Honey Harlot,” are available now and the third, “Both,” releases in May. In addition to her fiction writing, she is a poet, editor, engineer, Navy (Seabee) wife and the mother of three wonderful sons. She lives in Arizona in the shadow of an improbably green mountain with her family, the requisite black lab, a sizable collection of Wonder Woman figures, and far too many books. You can find out more about her latest projects here: www.marsheilarockwell.com/. Marcy is offering one copy of The Shard Axe to one lucky winner. Just leave a question for Marcy about tie-in fantasy, or tell her your favorite tie-in fantasy book to be entered. Open internationally and ends April 19th. Good Luck! 🙂 Very interesting. And you totally had me wanting to read your book even before the one line synopsis. Do you enjoy writing in a an already set up world where the world building and rules are mostly set before you start your story? Or do you find you would have liked to make your own rules? I think the only tie-in fiction I have read have been Star Trek novels of varying quality. Huh, interesting post. I have never read (that I know of) a tie-in book. Though I can see the appeal, I have a handful of games that I am simply addicted to and would read a book based on them in a heart beat. A good story is a good story, no matter where it comes from. I have always been a Dungeons and Dragons fan. I loved the books and video games and even the animation series. I have them all. There have been times that I wished not so much that I could make up my own rules, but that the rules already in existence were followed a little more closely. The world that The Shard Axe and my other novels, Legacy of Wolves and Skein of Shadows, are set in is called Eberron. It began life as a Dungeons & Dragons campaign setting like Greyhawk, Dragonlance, the Forgotten Realms, etc. When Dungeons & Dragons Online came along, they chose to set the online game in Eberron, but the way you play an online game is different than the way you play a tabletop game, so the developers had to tweak certain things about Eberron. For instance, in the tabletop version of Eberron, airships (like the one in the cover art above) are fairly rare, and docking towers for them can only be found in the largest cities. In the DDO version of Eberron, there are docking towers in every neighborhood. As a writer who is trying to appeal to both sets of Eberron fans – those who play in the tabletop version and those who play in the online one – it can be hard to try and reconcile things like that so that both sets of fans will enjoy reading the book and not feel like I got “their” Eberron wrong. Hopefully I managed to do that, but again, it requires some serious tightrope-walking skills! Hi, Kai! They’ve had some great video games over the years, haven’t they? I think my favorite, though, would have to be the Eye of the Beholder series. Really good graphics and interface for that time period, and an intriguing story line. I’d love to play them again now, just to see if they’re still as good as I remember them being. Anyone got a computer with a disk drive? LOL! I haven’t read any tie-in fantasy, but I have read tie-in sci-fi. In high school, I read countless Star Wars tie-in books to keep my brother company. He was a reluctant reader and this method of encouragement worked! My favorite series covered the Jedi training of Jacen and Jaina Solo, the twin children of Han Solo and Leia Organa Solo. In another series, I liked that Luke Skywalker had Mara Jade as a companion. Are your tie-in novels standalone? I ask because I know nothing about the worlds of DDO or D&D, but a “fantasy noir with an urban fantasy feel and a murder mystery at its core” does sound intriguing! It’s interesting that you mention Star Wars as being SF, since a lot of people consider it fantasy that happens to be set in space. But fantasy or SF, it does have a great selection of tie-in books, by some really good authors. My books are meant to be standalones, yes. Hopefully, reading them is no different from reading any other fantasy novel, except that there are a whole bunch of other novels set in the same place that you can go pick up after you finish mine. 😉 My next book, Skein of Shadows, which comes out as an ebook in July, IS a sequel to The Shard Axe, and it also features a character from Legacy of Wolves, so I’d suggest reading both of those before diving into SoS, but there’s nothing you need to read prior to starting either of those books in order to understand and enjoy them. Very informative post. Are there certain settings that you like to use in these books? What sort of rules & regulations are there for a tie-in? Do you have to have permission? Hi, Mary! Thanks for the questions! Yes, you do have to have permission to write for a tie-in property, because they are the ones who own the setting, not you. It’s their playground, and they decide who gets to play in it, and if you try to jump the fence and play there without permission, they will sic their legal dogs on you. Once you have that permission, there are rules you have to follow, as well. The most prevalent one is the signing of a Non-Disclosure Agreement (NDA). 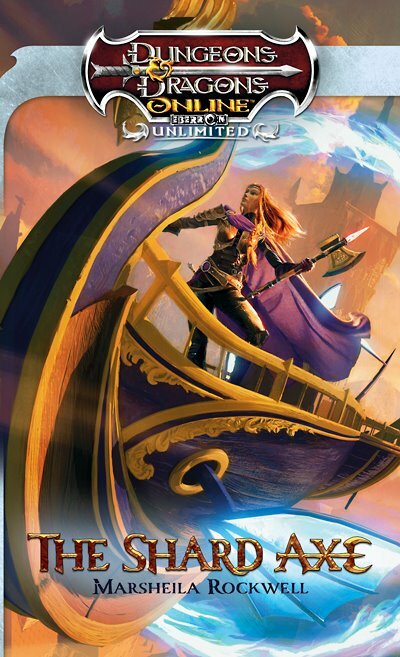 When writing for Wizards of the Coast, for example, I usually learn some things about the setting or the release schedule or upcoming products that the general population is not yet privy to. I have to agree to keep quiet about those things, or those legal dogs will get loose again, this time in my direction. Then, of course, there are rules that pertain to the particular tie-in property/company you’re writing for, which can vary a lot. Hi Marsheila, thanks for your insights. My first language is Spanish, so I apologize if I cannot make myself understood well. My question would be, isn’t somehow most literary activity some sort of “tie-in”? While certainly it is more evident when linking a work to a fictional world, as happens in Eberron, it can be said that novels that take place in the real world are somehow tied to its reality and thus related to it, having the capacity to reveal much about its cultures and aspects, as commented by some analysts. Yet, at the same time, both evident and subtle tie-in books push the boundaries of the world they are embedded in because, as Oscar Wilde mentioned once, literature ends up portraying things different from what they are. In the end, isn’t tie-in and non-tie-in literature a mixture of the individual perceptions of the writer and the message she/he wants to send and the setting that works as inspiration, being both dimensions blended and changed by the reader? First off, I would never know English wasn’t your first language if you hadn’t said something, so don’t apologize! What you say is certainly true – all literature is based on SOMEthing, and thus “ties in” to it – but the specific term “tie-in” when applied to fiction means that it ties into some other media property in particular. It’s often used synonymously with “work for hire,” which refers to fiction you are paid to write but which you have no rights to. So, when the phrase “tie-in” is used, it specifically means a work (usually a book) which ties into another media property that the writer does not own and has no rights to. An easy way to tell if something is a tie-in (if the media property logo on the front of the book isn’t enough to give it away) is to look at the copyright page. Instead of the author’s name, the property name will be listed. In my D&D books, Wizards of the Coast is listed as the copyright holder, not me. I created Sabira, but I have no rights to her. I can’t write more stories about her without WotC’s permission, and they could give her to another author to write about, if they wanted to. Thanks for the answer! I was not aware of the fact that the rights to characters found in tie-in novels belong to someone different from the writer. According to what you say, the usage of the term tie-in literature is then a technical one that pinpoints legal issues, although in a broad sense other texts may be regarded as “tied-in” to something. I’ve read some tie in fiction for a wide variety of sources, some good and some really bad. Was wondering…How much money do you make off of something like this for WotC and what rights do you keep. Hi, Jacob! Thanks for the questions! In regards to advances, royalties, etc. – all of that is governed by the NDA authors sign, so it’s not something we’re able to discuss publicly. Suffice to say, it’s not an avenue to independent wealth, heh. There are a lot of constraints involved in writing tie-in fiction, both in the writing and on the business side of things. But I will say that if you do well within those constraints, it opens a lot of doors for you. I’ve had several other tie-in opportunities offered to me because of the work I’ve done for WotC and the resulting relationships I’ve made with other tie-in writers. It’s a relatively small niche, but it’s one where you’ll never want for work once you break in. How fascinating! I like D&D and have played many games. I have read alot of the Forgotten Realms fiction which are similar to D&D but I am not sure if they fall into the Tie-in fiction category. i am not familiar with your character Sabira from D&D. How did you choose this specific character of was she chosen for you by the D&D publisher? Did you think about the character or the story idea first? Hi, Patricia! Thanks for all the great questions! Yes, the Forgotten Realms book are definitely tie-in books. I actually got started writing for Wizards of the Coast based on some stories I pitched to them in that setting, but ultimately I was assigned to write in Eberron, which is more of a steampunk/noirish setting where magic takes the place of technology and alignments are far more gray than what you usually see in FR. Thanks to everyone for all the great questions, and to The Bookpushers for asking me to participate in their Fantasy Celebration – it’s been a blast!